The Salina Regional Airport began in 1942, with construction of the Smoky Hill Army Airfield on 2,600 acres. After WWII, the airport became a Strategic Air Command base, with a twelve-silo underground nuclear missile complex. 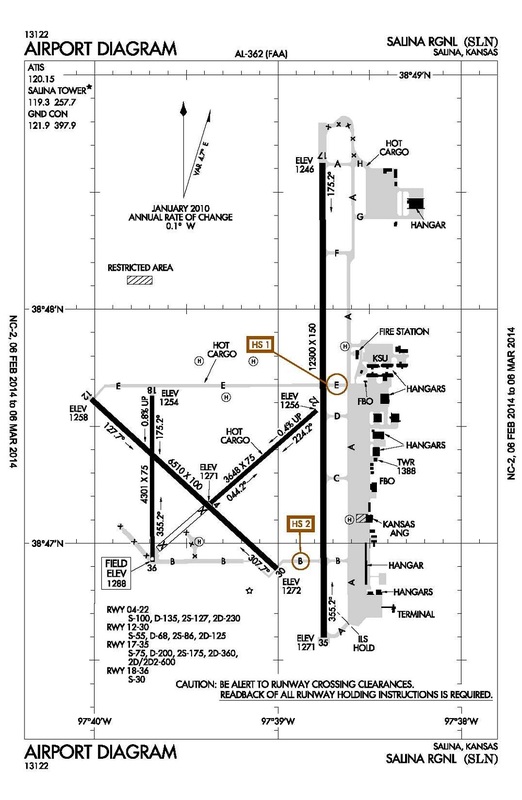 There was an enormous investment into the airport in the late 1950’s and early 1960’s, in preparation for use by heavy B52 bombers and KC-135 tankers. However, the base and all assets (including the ICBM’s) were removed and relocated elsewhere in 1965. Today, the airport has a contract control tower open sixteen-hours each day, averaging 268 daily operations. The airport is the home base for roughly 100 private aircraft, and said to be a popular stop for private jets to refuel during coast-to-coast flights. The airport serves as the home of the Kansas State University flight training program, whose local pattern operations account for roughly half of the airport’s traffic count. There is an ongoing Essential Air Service (EAS) contract awarded to SeaPort Airlines (based in Portland, OR) to fly 9-seat Pilatus PC-12’s to/from the Kansas City Intercontinental Airport (KMCI). FAA compiles ATADS data for this facility. Airport operations in 2012 were UP 27% vs. 2007 operations, and peak year. — Average AIP Subsidy is $7 per operation. …FAA’s new rule requires 1,500 hours of flight experience for new co-pilots on commercial passenger flights. The rule has a lower requirement of 1,000 hours, which will benefit selected larger flight training programs, which will include the one at KSU. The result may be a concentration of local pattern flying – and thus more noise impacts – at selected airports where these flight schools are based. …A master planning process has been approved by the airport authority, to update the 1991 Master Plan. The bulk of the $527K cost will be covered by FAA/AIP funds. …SeaPort Airlines’ re-selection by DoT, to provide 18-trips per week between Salina and KMCI, using 9-seat Pilatus PC-12 aircraft. The subsidy was set at $1,493,381 annually. The enplanements in 2011 totaled 2,705, which means DoT was offering to pay an average $552 per passenger for SeaPort to fly an average three paid passengers per flight, for a straight-line flight distance of 162 miles.